Gamecock Girl: Love is in the air...a Carolina proposal. Love is in the air...a Carolina proposal. This is the week for all of those sweet "awww" love stories...and we recently stumbled across this sweet proposal story from My Carolina Alumni Association. 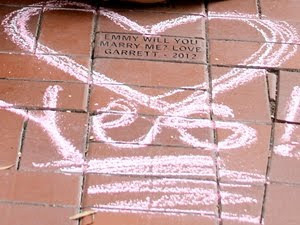 USC student Garrett proposed to his girlfriend Emmy with a personalized Horseshoe brick -- such a neat idea and something they can show their kids one day. Interested in advertising through Gamecock Girl? Email us at gamecockgirlblog@gmail.com for more information. Gamecock Girl, the Gamecock Girl title image, and all of the content on this site are copyrighted and protected under U.S. Copyright Law. Any use of material from this site without giving credit and linking back to Gamecock Girl is prohibited. Any use or imitation of the Gamecock Girl title image, logo, or blog concept without consent is prohibited. DISCLAIMER: This blog is for entertainment purposes only - a place to build a community for all Gamecock Girls. This site is not endorsed by University of South Carolina, the Gamecock Athletic Department, or any other University of South Carolina department. The information, opinions, and content posted here are for the enjoyment of readers and are solely the opinions of the authors of this blog. © GamecockGirl.com 2014. Theme images by Ollustrator. Powered by Blogger.